I would like to use Windows Task Scheduler to make a backup with DriveImage XML. The first problem, which I somehow managed to solve, is that Windows Task Scheduler will not run 32 bit programs if Windows is 64bit. So I followed this article, and added C:\Windows\SysWOW64\cmd.exeto the Program/script: in the actions of the task. 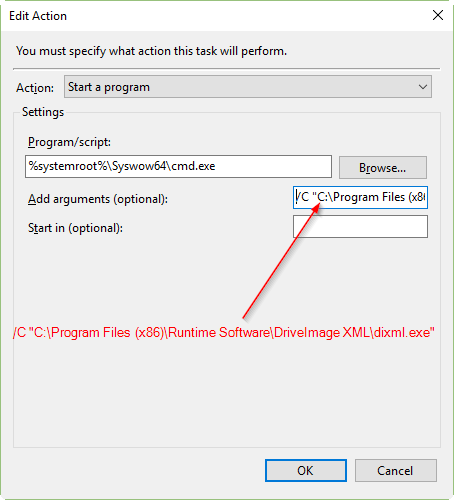 In Program/script I have added %systemroot%\Syswow64\cmd.exe and in the arguments I have added /C "C:\Program Files (x86)\Runtime Software\DriveImage XML\dixml.exe" This allows me to run DriveImage XML in Windows Task Scheduler, even if it is a 32 bit application. So if anyone can help me to setup DriveImage XML in Windows Task Scheduler I would be very grateful. I realized that I should not have quotation marks on the end path. %systemroot%\Syswow64\cmd.exe /C "C:\Program Files (x86)\Runtime Software\DriveImage XML\dixml.exe"/bc /tB:\\DRIVE IMAGES\\Windows10_maintenance_backup solved it. Not the answer you're looking for? Browse other questions tagged windows windows-10 64-bit task-scheduler driveimagexml or ask your own question. Is it possible to “declare” a windows cmd-file (batch-file) as 32 bit? Why doesn't Outlook properly open when scheduled to start using Task Scheduler?